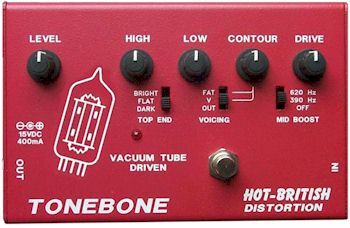 Tonebone official product page - "More than just distortion pedals, they are in fact amplifier channels incorporated into the pedals. One model, the red colored "HOT-BRITISH", sounds like a British style hot-wired modified tube amp: a lot of gain with tight ballsy low-end, focused mid's and crisp high's. The "HOT-BRITISH" has a "CONTOUR" control knob that works in conjunction with a three position "VOICING" selector switch."